A rapid, one step test for the qualitative detection of Heroin in human urine. For healthcare professionals including professionals at point of care sites. For in vitro diagnostic use only. Single use Heroin urine dip drug test. The 6-MAM One Step Heroin Test Strip is a rapid urine screening test that can be performed without the use of an instrument. The test utilizes an antibody to selectively detect levels of heroin in urine. This One Step Heroin Test Strip yields a positive result when the 6-MAM synthetic cannabinoid in urine exceeds 10 ng/mL. The One Step 6-MAM Test Dip card (Urine) is a lateral flow chromatographic immunoassay for the detection of single drug and its metabolites in human urine. This assay provides only a preliminary analytical test result. A more specific alternate chemical method must be used in order to obtain a confirmed analytical result. Gas chromatography/mass spectrometry (GC/MS) is the preferred confirmatory method. Clinical consideration and professional judgement should be applied to any drug of abuse test result, particularly when preliminary positive results are used. 6-Monoacetylmorphine (6-MAM) is one of three active metabolites of heroin (diacetylmorphine), the others being morphine and the much less active 3-acetylmorphine (3-ACM). 6-MAM is rapidly created from heroin in the body, and then is either metabolized into morphine or excreted in the urine. Since 6-ACM is a unique metabolite to heroin, its presence in the urine confirms that heroin was the opioid used. This is significant because on a urine immunoassay drug screen, the test typically tests for morphine, which is a metabolite of a number of legal and illegal opiates/opioids such as codeine, morphine, sulphate, and heroin. 6-MAM remains in the urine for no more than 24 hours so a urine specimen must be collected soon after the last heroin use, but the presence of 6-MAM guarantees that heroin was in fact used as recently as within the last day. The One Step 6-MAM Test Dip card yields a positive result when 6-MAM synthetic cannabinoid in urine exceed 10ng/mL. The One Step 6-MAM Drug of Abuse Test is an immunoassay based on the principle of competitive binding. Drug which may be present in the urine specimen compete against their respective drug conjugate for binding sites on their specific antibody. During testing, a urine specimen migrates upward by capillary action. A drug, if present in the urine specimen below its cut-off concentration, will not saturate the binding sites of its specific antibody. The antibody will then react with the drug-protein conjugate and a visible colored line will show up in the test line region of the specific drug strip. The presence of drug above the cut-off concentration will saturate all the binding sites of the antibody. Therefore, the colored line will not form in the test line region. A drug-positive urine specimen will not generate a colored line in the specific test line region of the Dip card because of drug competition, while a drug-negative urine specimen will generate a line in the test line region because of the absence of drug competition. To serve as a procedural control, a colored line will always appear at the control line region, indicating that proper volume of specimen as been added and membrane wicking has occured. The test strip contains a membrane strip coated with drug-protein conjugate (purified bovine albumin) on the test line, a goat polyclonal antibody against gold-protein conjugate at the control line, and a dye pad which contains colloidal gold particles coated with mouse monoclonal 6-MAM antibody. For Forensic Use Only. Do not use after the expiration date. The test Dip card should remain in the sealed pouch until use. The used test Dip card should be discarded according to federal, state and local regulations. The kit can be stored at room temperatture or refrigerated (2-30°C). The test Dip card is stable through the expiration date printed on the sealed pouch. The test Dip card must remain in the sealed pouch until use. DO NOT FREEZE. Do not use beyond the expiration date. The urine specimen must be collected in a clean and dry container. Urine collected at any time of the day may be used. Urine specimens exhibiting visible particles should be centrifuged, filtered, or allowed to settle to obtain a clear specimen for testing. Urine specimens may be stored at 2-8°C for up to 48 hours prior to testing. For prolonged storage, specimens may be frozen and stored below -20°C. Frozen specimens should be thawed and mixed before testing. 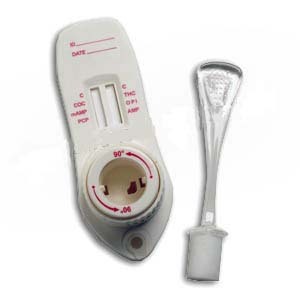 Allow the test strip, urine specimen, and/or controls to reach room temperature (15-30°C) prior to testing. Bring the pouch to room temperature before opening it. Remove the test strip from the sealed pouch and use it as soon as possible. With arrows pointing toward the urine specimen, immerse the test strip vertically in the urine specimen for at least 10-15 seconds. Do not pass the maximum line (MAX) on the test strip when immersing the strip. See the illustration below. Place the test strip on a non-absorbent flat surface, start the timer and wait for the colored line(s) to appear. The result should be read at 5 minutes. Do not interpret the result after 10 minutes. Certain medications containing opiate derivatives may produce a positive result. Additionally, foods and tea containing poppy products (the origin of the opiate) may also produce a positive result. A Positive Result indicates presence of the drug or its metabolites but does not indicate level of intoxication, administration route or concentration in urine. A Negative Result may not necessarily indicate drug-free urine. Negative results can be obtained when drug is present but below the cutoff level of the test. The following table lists the concentration of compounds(ng/ml) that were detected positive in urine by The One Step 6-MAM Test Dip card (Urine) at a read time of 5 minutes. Fifteen (15) urine samples of normal, high, and low specific gravity ranges (1.005, 1.015, 1.030) were spiked with drugs at 50% below and 50% above cut-off levels respectively. The One Step 6-MAM Test Dip card was tested in duplicate using 10 drug-free urine and spiked urine samples. The results demonstrate that varying ranges of urinary specific gravity does not affect the test results. The pH of an aliquoted negative urine pool was adjusted to a pH range of 4.0, 4.5, 5.0, 6.0, and 9.0, and spiked with drugs at 50% below and 50% above cut-off levels. The spiked, pH-adjusted urine was tested with the One Step 6-MAM Test Dip card. The results demonstrate that varying ranges of pH does not interfere with the performance of the test. A study was conducted to determine the cross-reactivity of the test with compounds in either drug-free urine or 6-MAM positive urine. The following compounds show no cross-reactivity when tested with the One Step 6-MAM Test Dip card (Urine) at a concentration of 100 μg/mL.